Her kan du læse om den forskning der udføres i forbindelse med projektet - både i lejren og i laboratorier rundt omkring i verden. Læs om boringen af "hoved-iskernen"
Ice cores - Revealing secrets of past climate from UiB - Universitetet i Bergen on Vimeo. Der er blevet boret iskerner siden 1955 på Grønland og siden da er et utal af korte iskerner og iskerner der strækker sig gennem hele iskappen blevet boret. Målet for projektet EastGRIP – er at bore en iskerne på 2550 m gennem hele iskappen midt i den nordøstgrønlandske isstrøm (The Northeast Greenland Ice Stream, NEGIS). 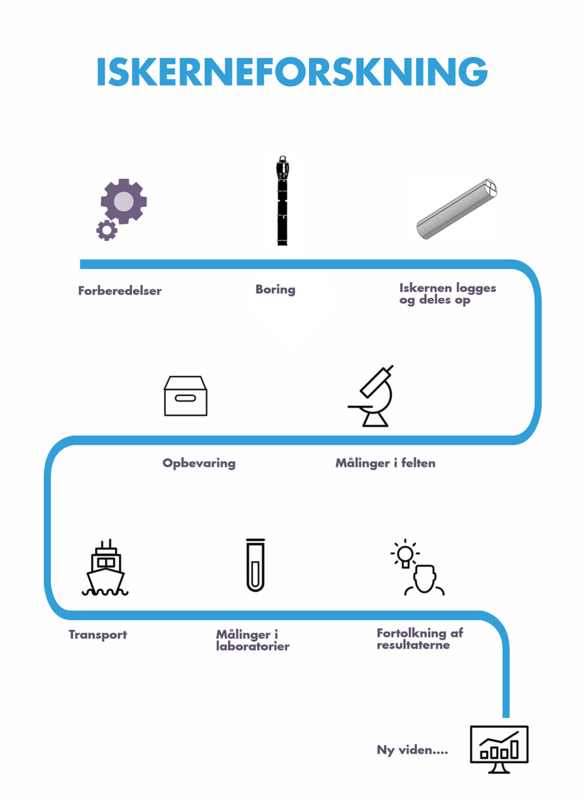 Klik på grafikken nedenfor og lær mere om hvordan iskernen bores, hvilke målinger der foretages på iskernen og hvilken viden vi opnår fra resultaterne af målingerne. Selv om projektets hovedaktivitet er at bore en iskerne gennem den 2500 m tykke iskappe, udføres der også et væld af andre projekter og målinger i lejren; der bores kortere iskerner, foretages målinger på sneoverfladen (f.eks. hvor meget sne der akkumuleres, strålingsbalance, samt måling af gasser og vanddamp), foretages radar målinger, målinger med drone og meget mere. Ice cores needs to be kept at low temperatures (-20°C or colder). Therefore, both drilling and measurements are done in manmade ‘caves’ under the snow surface. These caves are built by digging trenches in which giant balloons are inflated and covered with snow. Once the snow has stabilized the balloons can be deflated leaving a cavity. The excavations are on the way of the science trench, but there is still a long way to go. The pit will reach seven metres deep when the excavation is finished. The future trenches are slowly being filled with the huge balloons which are baing inflated. The balloons are slowly covered with the snow that was previously excavated to make the trenches. After a couple of days the snow will have formed a rock-solid roof. Read more about how to build laboratory under the ice with balloon technique in the ScienceNordic article. Much of the 2016 field season was used to transform the freshly blown balloon trench into a working drilling trench with the aim to start deep drilling in early 2017. Construction of a drill trench floor and installation of the drill tower was a huge part of the 2016 field season. In the beginning of the field season 2017 installation of deep drill apparatus was completed. This includes among others electrical systems in trench and systems for handling ice chips and fluids (see section on drilling). The beginning of the early field season 2017 was also used to make the infrastructure of the science trench. Drill trench viewed from the entrance end with the winch in the foreground and electrical installations to the right. The drillers are tilting the tower to extract the ice core. Drillers control cabin to the right of the tower. Drillers workshop in the background. The drilling of the main ice core began late in the 2016 field season, so the borehole casing could be installed in the beginning of the 2017 season before the main drilling could start. To drill the ice core a special ice core drill has been developed by a group at the Centre for Ice and Climate. The ice core drill is mounted to a cable and contains all necessary electronics and a motor. Schematic draving of drill with 2.2 m core barrel used in 2017 at EGRIP. Notice that the drawing is shortened at several points marked by white 'lines'. The drill head rotates and cuts its way through the ice using knives. The core barrel consists of an inner and an outer part. The inner barrel is covered with spirals (see picture below). The ice core is pushed into the inner core barrel, while excess ice in the form of ice chips is transported between the inner and outer core barrels using the thick spirals. The ice chips are then pumped into the chips champer. Once the drill is filled with ice the rotation stops and the process of raising the drill using a winch starts. "Core-catchers", small spring-loaded knives, cut into the ice core and prevents it from gliding out of the drill while it is being pulled towards the surface. Once the drill reaches the surface the tiltable drill tower makes it possible to transport the core in the core barrel to the extraction freezer where the core is pushed into a tray for further processing. Drillers Dennis and Sune push the core barrel containing ice core into the extraction freezer (left), where Lydia and Emilie wait to receive it. The bottom of the ice core is visible in the barrel (middle). Sune is then pushing the core out of the core barrel into a tray (right). – Or is he baking a pizza? The conditions are not alike throughout the ice. Thus, the drilling setup has to be changed at certain depths. For example, the length of the ice cores drilled changes. At the top part of the ice, cores of about 2m are drilled. This is especially important in a certain section of the ice called the ‘brittle zone’. In this section the ice is fragile. Once the drilling passes this zone longer ice cores of about 3.5 meters are drilled. Another condition that changes with depth is pressure. At the bottom of the ice sheet the pressure is approx. 280 atmospheres because of the enormous weight of the ice above. Due to the high pressure a borehole will quickly close. To prevent this from happening borehole fluid of approximately the same density as the surrounding ice is used. On the Centre for Ice and Climates website you can find further information on drilling techniques and development of the drills. Logging and documentation of ice core quality and integrity is done inside an active freezer unit installed in the logging tunnel. Here, the temperature is approx. -30°C. The tunnel is kept low in order to ensure, that the temperature is close to the temperature of the ice sheet. To begin with the drill fluid is removed from the ice core using a vacuum cleaner. Hereafter, the top of the newest core piece is fitted to the bottom of the previous core piece. By checking that the two pieces fit precisely together, the possibility of loss of ice core can be ruled out. The length of the core is then measured. It is the sum of all these measured core lengths that gives the total length of the ice core. The core length is different from the measured drill cable length because the cable is stretched by the weight of cable and drill. The core is then marked in sections called "bags". Each bag is 0.55 m and three bags, i.e. 1.65 m, constitute a processing "run". Cutting of sample sections is done using a horizontal band saw, or swiss saw (a vertical saw). Below you can see the EGRIP cutting scheme marking which cuts will be performed. However, not all of the cuts are done at once and some cuts are not performed at all in the field; regarding the ice before and in the brittle zone the CFA gas and CFA chem sections are cut once the ice is back in Europe. The SC and main sections constitute the "archive piece" - these two sections will not be split in the field either). Some measurements are conducted in the field, while others are done in the labs back at the laboratories at the participating universities. 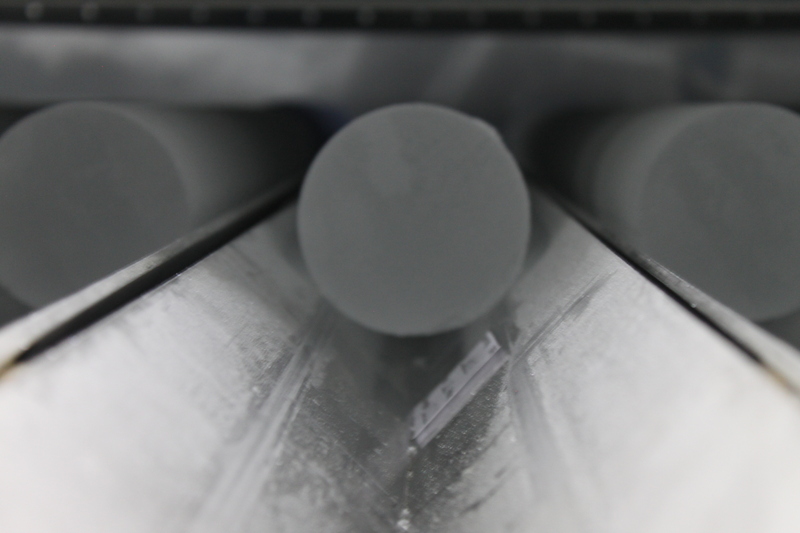 Before the measurements can be performed, the ice core is cut into different pieces (see previous section). Below you can see a schematic drawing showing which part of the ice core is assigned to the different measurements. In this section you can read more about the measurements performed in the field. An integrated AWI (Alfred Wegener Institute) system records di-electric properties on the full and uncut core. This method is used for measurements of the ion content of the ice. The scientific explanation of the technique is quite complex and will not be explained in details here. However, the overall idea is to build a capacitor consisting of an uncut ice core placed in between two conducting plates. The capacitans is measured along the lenght of the ice core. Because the capacitans is influenced by the amount of ions present in the ice, the DEP can be used as a measurement of the ion content. ECM measurements being carried out After the first cut in the horizontal saw, the core will be mounted in the Danish ECM setup for conductivity measurements. First the core is cleaned with a microtome knife. Hereafter, the electric conductivity of the ice is measured by moving two electrodes with an electrical potential difference of about 1000 V along the ice surface. The resulting current is a measure of the acidity of the ice. A significant feature of this so-called ECM record is that it contains large peaks caused by past volcanic eruptions. During the eruption large amounts of sulfur dioxide (SO2) are released to the atmosphere, where it is eventually turned into sulphuric acid (H2SO4), which shows up in the ECM record. Inside the science trench there are two warm laboratories. 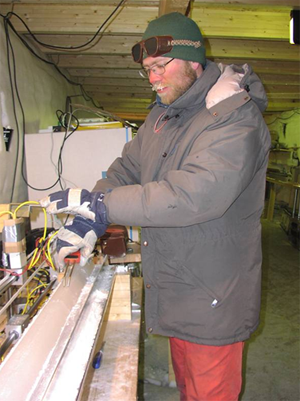 In one, continuous measurements of stable water isotopes on sticks of ice core are performed and in the other measurements on physical properties are conducted. An atom is composed of a nucleus and one or more electrons bound to the nucleus. The nucleus is made of one or more protons and typically a similar number of neutrons. However, the number of neutrons can vary and the different variants of the same atom is thus called isotopes. Below three different water molecules formed from 2 hydrogen atoms and different oxygen isotopes (similar, but with different number of neutrons in the nucleus) are depicted. The most common form is H216O. For each 10,000 water molecules in nature, only 3 are H217O and 20 are H218O. A water molecule consists of one oxygen atom and two hydrogen atoms. However, the atoms can vary with respect to the number of neutrons (see picture to the right). This means that some of the water molecules will be heavier than others. The maximum amount of moisture that air can hold drops with decreasing temperatures. When humid air cools, at some point the water molecules will condensate to form precipitation. As the heavier isotopes have a slightly larger tendency to condensate, the humid air mass will gradually lose relatively more and more of the water molecules containing heavy isotopes (18O and Deuterium; D or 2H). Every time precipitation forms, the air mass will become more depleted in heavy isotopes. In the language of physics, fractionation takes place. During cold conditions (e.g. during winter or in a cold climatic period), the air masses arriving in Greenland have cooled more on the way, thereby having formed more precipitation and the remaining vapor is therefore more depleted in heavy isotopes (corresponding to lower δ18O vales). Thus, the isotope values in the snow falling at the Greenland ice sheet reflects the level of rain-out from the air mass, which correlates with temperature. Therefore, by measuring the isotope composition in the ice core it is possible to reconstruct the annual temperature variations year by year. For the active days, approx. 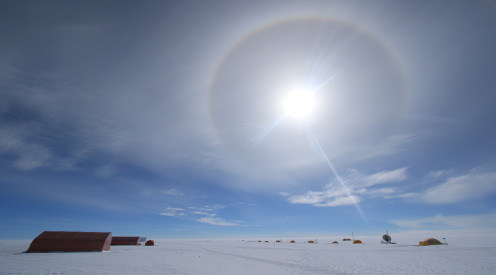 13-15 meters of ice core can be processed per day in camp using a method called Continous Flow Analyses (CFA). You can read more about the method in the 'measurements in labs' section. Ice crystals in different types of polarized light. The squares are 1 cm on each side. The phrase "Physical Properties" covers a range of different measurements. Many of these measurements are conducted in laboratories at the universities participationg in the projects (e.g. the Alfred-Wegener-Institute in Germany). 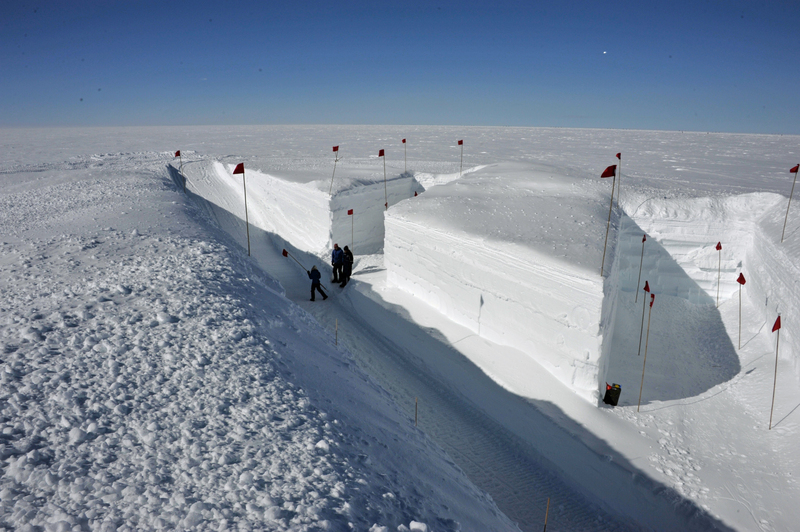 However, for the analyses that require fresh ice, systems will be set up in the science trench and in the before mentioned designated warm lab. Here, the physical properties of the ice, e.g. the crystal structure, is measured. Ice core in core buffer Ice cores needs to be kept at low temperatures (-20°C or colder). In the field ice core's are stored the surface of the ice in "caves" similar to the trenches described under "Preparations". Brittle ice is stored in the ice core buffer prior to being processed. The cores are left in the core buffer over winter so they are less brittle when processed in the science trench. The ice that is being shipped back to Copenhagen (see previous sections) will be stored in large freezers which holds the ice core archive. The archive contains a total of 15 km of ice from several Greenland deep drillings and many other drilling projects. The archive makes it possible to study the old cores when new measurement techniques are developed or new ideas emerge. From the EastGRIP camp the ice is flown to Kangerlussuaq (Danish name: Søndre Strømfjord) in the south western part of Greenland. Kangerlussuaq has long been a logistical focal point for scientific expeditions, because it can be reached by direct flight from Copenhagen and has the best airport and some of the best weather conditions in Greenland. Both People and cargo (including ice cores) are transported in large LC-130 Hercules airplanes operated by the 109th division of the New York Air Guard. In Kangerlussuaq the ice is stored in a freezer. Hereafter, most of the ice shipped back to Denmark and finally transported by truck to the Centre for Ice and Climate or other storage facilities. Throughout the journey it is of the uppermost importance that the ice is kept under low temperatures. Gas bubbles trapped in the ice when an ice core can be analysed in order to determine the composition of the atmosphere hundreds of thousand years back in time. This is done either by by melting content (e.g. for analysis of the CH4 or N2O) or crushing the ice (for anlysis of the CO2 content), thus releasing the samples of past atmospheric air from the ice and analysed. Concentration measurements can be performed using a gas chromatograph (GC), where isotope ratios are determined using mass spectrometry. You can read more about sampling and analysing the gas here . CFA is short for 'Continous Flow Analysis' - a method used to prevent contamination of samples thereby enableing measurements of impurities of very low concentration in the ice. A part of the drilled ice core is melted continuously at a speed of approx. 3 cm/min on a gold coated plate which is located in a cold lab (–20°C). Only the inner part which was never in contact with ambient air is used and is pumped into a warm lab, whereas the possibly contaminated water from the outer part is rejected. The melt water stream still contains air bubbles (approx. 10% of the total volume) from the enclosed air in the ice. The amount of insoluble dust, and the size distribution of the particles. The concentration of NH4+, Ca2+, NO3–, Na+, SO42–, HCHO, and H2O2. The impurities come from different sources and thus yield different information about the climate system. Some of the impurities have an annual cycle, and these records can therefore be used for identification of the annual layers in the ice. One example is Ca2+, which comes mainly from dust and has highest concentration in spring. A visible volcanic ash layer in the ice core at 1078 m depth (drillers’ depth). Possibly the well-known 10,400 yr old Saksunarvatn tephra layer. When large volcanic eruptions occur, huge quantities of acids are introduced into the atmosphere and distributed over vast areas. In ice cores, volcanic layers can sometimes be identified by volcanic ash particles (tephra), but more often the layers only contain elevated concentrations of acids seen in the ice cores as mainly sulphate and sometimes fluoride. In Greenland the nearby Icelandic and Alaskan volcanoes have a strong imprint in the ice cores. However, if the volcanic eruptions are strong enough to inject acids into the stratosphere, also volcanoes from the tropics or even the southern hemisphere can be identified in Greenland. Examples of well-known historic volcanoes that have left a clear fingerprint in all Greenland ice cores are Tambora, Indonesia (1815), Krakatau, Indonesia (1883), Katmai, Alaska (1912), El Chichón, Mexico (1982), and Mount Pinatubo, Philippines (1991). The largest volcanic events are also impacting global climate by injecting large amounts of small particles (so-called aerosols) into the stratosphere thereby partially shielding the Earth from solar radiation and reducing temperatures. The impact of volcanoes on past climate is constrained from the long records of past volcanism reconstructed from Greenland and Antarctic ice cores. Acid and tephras from volcanic eruptions are also used for dating purposes and for linking ice cores with other climate archive. Once measurements are completed the results needs to be processed. This involves statistical analysis and comparison with previous findings. In order to use the measurements from an ice core they need to be linked to a specific time or period. Establishing a time scale for the ice core is done using a combination of annual layer counting and computer modelling. Ice core time scales can be applied to other ice cores or even to other archives of past climate using common horizons in the archives. For the 2018 field season Prof Ilka Weikusat (University of Tuebingen and AWI), 3 Uni Tuebingen-Alumni (Nico, Julien, Sonja) + 2 more Uni Tuebingen co-affiliates (Daniela, Jan E.) joined the EGRIP camp work. Read more about their stay at EGRIP in the article (click on the picture below) from the Uni Magazin (article starts on page 15 of the pdf).